make it happen at the mini maker faire! 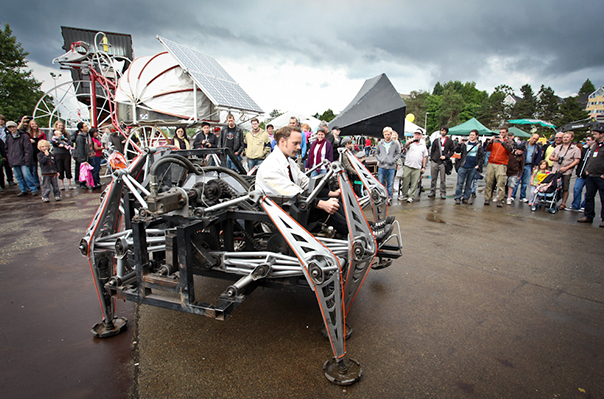 This Saturday and Sunday, the PNE Forum will be transformed into a haven for ingenuity and curiosity as the ever-popular Vancouver Mini Maker Faire returns! We're excited to partner with the VMMF to help deliver this fantastic event, as we know from experience that many Modo members will be attending and exhibiting this year. Expect robots! interactive art! 3-D printers! yarn bombing! games for kids! and a Show 'n Tell like you wouldn't believe! When you're making the rounds at the VMMF, stop by the Make It Happen booth where we'll have experts on hand to advise on how you can work the #SharingEconomy to Make, Move, Finance and Share your big dream. Plus, a big, fun map of all the sharing initiatives across town! Sponsored by Vancity and spearheaded by Modo, the booth is a collaboration by Share Vancouver. Find it listed as part of the #100in1Day blitz of interventions across the country! Scroll down to our community calendar for a chance to win 2 tickets to VMMF! summer promotion – tell your friends! car free day is june 15! Lately, we’ve had plenty of cause to celebrate – expanded locations, new vehicles, surging member numbers, and of course, hiring our first CEO. 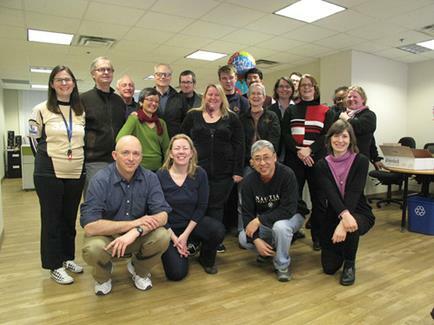 But Modo also celebrated two milestones among our team that we'd like to share. In March, we saw our first-ever retirement, as long-time, much-beloved Member Care Coordinator Michael Anstead answered his last Urgent Call (we hear he's making lots of art now!). Then in May, we toasted Phil Baudin, who transitioned out of his role as Executive Director to become Finance Director. Read about both celebrations on our blog. These milestones are important to recognize, as it is the dedication and service of our staff that is the oil in this co-op's engine. Cheers to Michael and Phil! As a long-time partner and champion of Modo, Vancity has created a special offer for Modo members seeking mortgage solutions. The Down Payment Helper Mortgage is an innovative program that sees Vancity contribute up to half of the minimum 5% down payment required when purchasing a home up to $500,000. In addition, Vancity's Mortgage Specialist will work with you to ensure this program is the right fit. You can even save up to $1,500 on legal and appraisal fees. On top of that, Vancity will gift you $100 Modo carsharing credit when you take a new mortgage through this program! This offer is only available until June 30, 2014. If interested, contact Ryan McKinley, Vancity Senior Mortgage Development Manager at ryan_mckinley@vancity.com, or 604.340.1611. Thank goodness for summer! All that sun's got us feelin' the love, so we're offering a special Summer Promotion to new members to help them get behind the wheel for a weekend romp, a hike in the mountains or an afternoon at the U-Pick. Tell your friends we're giving away a free 1-month trial membership, plus $40 carsharing credit to new members! Remember, if you refer a friend you'll receive $25 carsharing credit (be sure to tell them to mention your name at sign up!). This month marks the 10th anniversary of Car Free Day in Vancouver! Beginning with political roots on Commercial Drive, Car Free Day was an idea to reclaim streets and oppose increased traffic in our city. This message is part of Modo's own mandate and one of the long-term goals of carsharing. 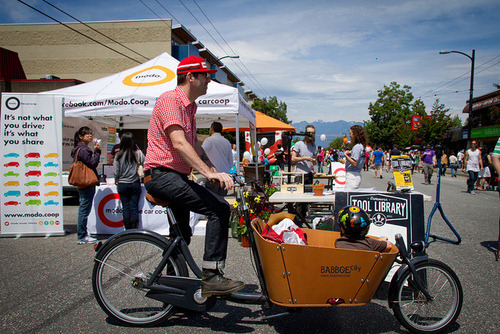 With four neighbourhoods celebrating Car Free Day, Vancouverites can travel across the city, exploring new avenues, learning about amazing place-making projects, being humans together, and contributing to a healthy, connected city. Check out some photos of Modo members and Community Partners from last year's Car Free Day on Main. This year, Modo will be set up at Main Street and 13th Avenue with our friends from Village Vancouver and HUB, asking passersby to "Imagine Your Ideal Neighbourhood." If you can't make it to Main Street, stop by the West End, Kitsilano or Commercial Drive to take part in the festivities! Thanks to our friends at Car Free Day for including us in their celebration, and for their dedication to keep this community going 10 years strong! >> NEW LOCATIONS How do we choose a new location for our vehicles? Our Information Systems Director demonstrates an example of crowdsourcing and announces our newest (upcoming) location in Richmond. >> NEW TRUCK IN SURREY Find a brand new pickup truck at Surrey Central SkyTrain – enjoy! >> MEMBER PERK Our friends at The Co-operators are offering Modo members reduced rates on home insurance, travel insurance and group benefits for your business! >> CAR SEATS Does your family require a car seat when using a Modo? Any tips to share with fellow members, like Jocelyn? >> FUEL CARD A friendly reminder that our fuel cards will only work at the pump, not inside the station. Select a pre-authorized dollar amount between $40-$60 and you shouldn't have any trouble. For more pro tips, check out the Modo blog! The Greatest Show (and Tell) on Earth! Buy your tickets online and get 15% off! Email freestuff@modo.coop for the promo code. >> CONTEST: Want to win a pair of tickets to VMMF? All you gotta do is snap a photo with your Modo! 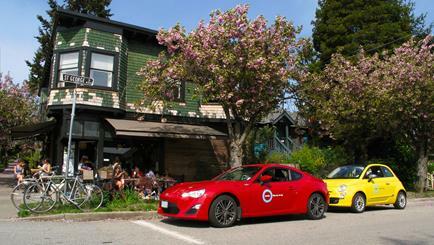 Share your photo via Twitter (tag @modo_carcoop) or on our Facebook page to enter. Winners drawn at random, announced on Friday, June 6. Are you ready to run? Registration is still open for this event, and Modo members can get a discount by emailing freestuff@modo.coop. Join the Modo Cheering Squad at our Water Station near Kits Beach at the 15-km mark! Email tommy@modo.coop to learn more. Find a 2012 grey Fiat 500 (#397) behind 2020 Arbutus Street, on the corner of West 4th, in stall #6 next to the Modo sign. There's now a 2013 white Dodge Grand Caravan (#548) instead of a 2010 Grand Caravan. There's now a 2014 grey Nissan Sentra (#531) instead of a 2012 Fiat 500. There's now a 2013 white Nissan Sentra (#538) instead of a 2011 Sentra. A 2014 red Nissa Versa Note (#543) replaces the 2011 Mazda 2. The 2008 Toyota Prius is still there. A 2014 grey Nissan Micra (#541) joins our 2012 Nissan Juke. A 2013 green Fiat 500c convertible (#512) will live here until its permanent home is ready. A 2014 red Fiat 500L (#529) will live here until its permanent home is ready. There's now a 2014 blue Nissan Versa Note (#495) instead of a 2007 Toyota Yaris. There's now a 2014 silver Nissan Sentra (#532) instead of a 2007 Toyota Camry. There's now a 2014 blue Nissan Sentra (#539) instead of a 2011 Sentra. There's now a 2014 blue Nissan Versa Note (#535) instead of a 2010 Toyota Matrix. Find a 2011 blue Nissan Sentra (#336) on the east side of Joyce Street, in front of 5426 Joyce between Church and Cherry Street. Just a few blocks south of Joyce SkyTrain, and one and a half blocks north of Kingsway. There's now a 2014 white Nissan Versa Note (#537) instead of a 2007 Versa. A 2013 red Dodge Grand Caravan (#534) will live here until its permanent home is ready. Two cars lived here temporarily in March and April, but have now moved to a permanent home at Surrey Central SkyTrain. There are now a 2014 white Nissan Frontier pickup truck (#533) and a 2014 blue Toyota Prius C (#507), in addition to the 2008 red Toyota Prius.